Architecturally and historically significant properties are valuable components of dynamic and stimulating communities. They contribute aesthetic richness, diversity, context, and a sense of place. Given the momentum gathering behind new ideas of urbanism, transportation, density, sustainability, and overall quality of life, this policy statement endeavors to provide guidance for working with the existing built environment, especially with the buildings that will constitute a living heritage and treasured historic resource to future generations. It is intended to help others recognize the importance of our existing built environment and identify those elements and qualities that contribute to its unique character and worth. It shall also serve as a guide for maintaining and adapting these significant places as we work within our communities to grow and enhance our inherited urban fabric through the addition of new buildings and the new ideas they represent. New development and redevelopment efforts should respect a community’s sense of place and its urban context by retaining and integrating significant buildings and properties into related development or redevelopment schemes. This approach is a natural step in a community's evolution—the mix of 'old and new' offers a connection to a community's past while building for the future. Historic buildings, in particular, should be integrated in a way that retains their historic character and cultural relevance, not just their physical presence. Neighborhoods, districts, and collections of historic buildings, either developed within a fairly narrow time frame or that have evolved over time, have their own valuable character and context that is more clearly expressed by the collection than by its individual buildings. New development efforts should strive to identify the character of such existing properties and support designs that are consistent and which complement that character. Buildings are the deliberate assembly of many parts; they reflect the priorities, values, and skills available of a particular place at a particular time, resulting in the uniqueness of these buildings, and should be retained and preserved as a whole. Interior character and features are often equal in importance to the exterior. Architecturally and historically significant interiors should be respected and integrated into new design approaches. The practice of retaining a buildings' facades only is not considered an acceptable alternative to the retention and preservation of the whole building. Similarly, salvage of historic features, details, or materials for reincorporation into other buildings, while it can be a sustainable and responsible endeavor, should not be considered as equivalent to or a substitute for substantial retention of the complete building. Due to the time and effort required to achieve formal historic designation of a site or building, most historic properties do not bear formal historic designation, even if they are readily eligible. The lack of such designation does not signify lack of architectural or historic value or integrity. 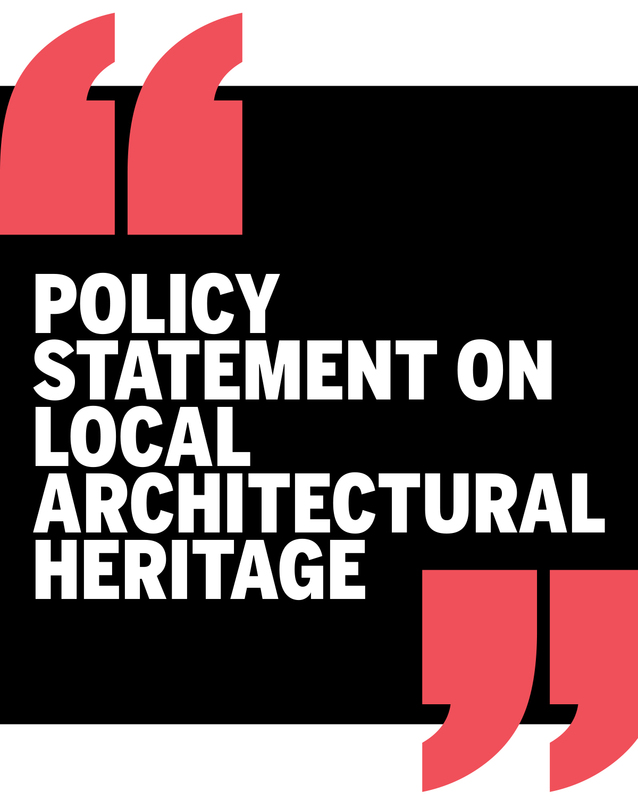 The Chapter should endeavor to support appropriate designation of historic or significant properties, and especially those that offer permanent protections. Historic designations include local Landmark designation, State Recorded Texas Historic Landmark (RTHL), State Antiquities Landmark (SAL), listing in the National Register of Historic Places (NR), or National Historic Landmarks (NHL). Buildings and properties that have been recognized by AIA Dallas, either through the 25-Year Award, Design Award, or other form of recognition, should be treated as architecturally and historically significant buildings. The Chapter should endeavor to continue supporting these buildings and properties. The Secretary of the Interiors Standards for the Treatment of Historic Buildings is the established, nationally accepted standard for the appropriate treatment of architecturally significant and historic buildings, and should be utilized by the chapter. WHAT DOES IT MEAN TO PRESERVE? To preserve is to identify a building’s character-defining features and to incorporate them into current and future plans so that the original vision, essential character, and historic record intrinsic to the building are maintained within a setting consistent with that original to that building. The guiding principles for this approach are those contained in the Secretary of the Interiors Standards for the Treatment of Historic Properties. The following definitions are the basis for the 4 standards of treatment described in the Secretary of the Interiors Standards. They are included here to provide common definitions of terms and to outline a time-proven methodology for working with the existing built environment. In a culture focused on what is to come, the value of the work done to achieve our current opportunities may not always be readily apparent. The following serve as a reminder of some of the qualities available through our living heritage. As the largest, most visible, and most tangible evidence of their efforts, our existing neighborhoods and the buildings that define them serve as perhaps our truest reminder of the culture and capabilities of previous generations who lived in our communities. Preserving and appreciating this evidence has benefits and opportunities beyond just the restoration of historical buildings, neighborhoods, or landscapes. It is key to maintaining the cultural value and intrinsic character of the place. There are well documented economic development opportunities associated with the preservation and reuse of existing urban fabric. Beginning with substantial local, state and federal financial incentives available specifically to projects that preserve important historic elements, often there is also code and zoning relief, savings on infrastructure costs, desirable locations, and a marketing advantage over newer developments. Identification and protection of neighborhoods through readily available zoning tools (historic districts, conservation districts, etc.) are often an important element in neighborhood stabilization and results in improvement in property values. It is often said that the most sustainable building is the one that is already built. The restoration of existing buildings and places conserves resources by minimizing waste and through reusing and repurposing existing structures and land. Many buildings designed during a prior time that did not rely as heavily on mechanical/electrical systems for comfort already incorporate features that have been rediscovered in modern design for their efficient use of energy and their benefits to quality of life. In most case, the preservation of existing buildings and neighborhoods have proven to be an excellent starting point for the integration of other new development opportunities and environmentally sustainable growth that have long lasting positive economic impacts. In some cases, they become a new destination as an attraction for both the communities and visitors. Preservation even allows elements that have since outlived its purpose to attract new creative aspiration for opportunities and invigorate decaying neighborhoods. Historic conditions and early urban planning designs often provided better street activation and pedestrian-friendly environments than more modern approaches. The preservation of these elements fits well within desire for today’s urban planning and a place for renewed activity.